NEW YORK – New Year’s Eve is one of the most exciting dates on our calendar year for about seven billion people. It is the week after Christmas, so it is family at home for some or a night to go out and party for others. There is nothing wrong with either of those choices and I have done both. I want to wish you all a very Happy New Year’s Eve! I hope you are able to be with friends or family and if not, that’s ok too. There are so many people walking around in every direction. The city is lit like a festive wonderland and smiles are everywhere. Watch the ball drop on TV, if you can’t be there. There is simply no better place in the world to be on New Year’s Eve, then New York City. It is the pinnacle celebration of planet earth. I have been to Times Square for New Year’s Eve three times in my life. Three times I’ve watched that ball drop into a sea of party people and by 1:00 AM EST, the only people left on the street are sanitation workers cleaning up the confetti. It’s a strange sight if you have never experienced it before. You go from being surrounded by a million screaming people, celebrating the biggest block party on the face of the planet to seeing dozens of sanitation workers in less then an hour. If you can recall that, then you were there. Knowing what to expect, the second time I went to see the ball drop, I immediately hit a bar within seconds of the ball dropping. Have you ever seen a place get instantly packed? It’s like a rain delay at a baseball stadium. Boom, heres 500 people shoulder to shoulder looking for a drink. It is quite a sight. Because I have moved around so much, many of my friends would ask me which time zone I celebrate New Year’s Eve from. My reply was New York City because I was born there. I believe that your inner life clock is predicated on the place where you were born and where your first heartbeat occurred. That is the time zone to your life clock. So, if anyone ever asks you that same question, you will now know how to answer it. I hope everyone enjoys themselves tonight and drinks responsibly. Remember, there are a lot of kids out there trying to have a good time. Take a cab! At midnight, it’s Goodbye 2011 and Hello 2012. Be Safe! The Giants will be at home when they play the Cowboys on New Year’s Day at 1:00 PM EST. I predict a Giants win 31-21. 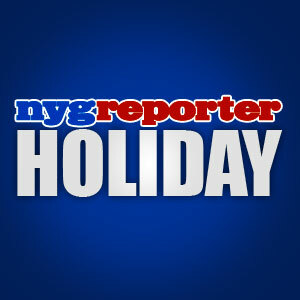 RD – nygreporter.com – Happy New Year’s Eve! This entry was posted on Saturday, December 31st, 2011 at 6:01 AM and is filed under 2011 Fantasy Football, 2011 New York Giants, 2011 NFL Playoffs, 2011 NFL Regular Season, Big Blue, Bill Parcells, Chris Mara, East Rutherford, Eli Manning, Ernie Accorsi, G-Men, George Martin, Giants, Giants Coaches, Giants Front Office, Giants History, Giants Roster, Giants Stadium, Hamps Camp, Jerry Reese, John Mara, Jonathan Tisch, Justin Tuck, Kevin Gilbride, MetLife Stadium, New Jersey, New Meadowlands Stadium, New York, New York Football Giants, New York Giants, NFC East, NFL, NFL New York Giants, NFL Playoffs, NFL Schedule, Nilay Shah, NY Giants, NYG, NYG Blog, NYG Charity, NYG Draft, NYG Exclusive, NYG Fantasy Football, NYG Holiday, NYG Playoffs, NYG Regular Season, NYG Reporter, NYG Road Warriors, NYG Schedule, NYG Story, NYG Website, nygreporter, Pat Hanlon, Perry Fewell, Roger Goodell, Steve Tisch, Timex Performance Center, Tom Coughlin, Tom Quinn, University of Albany, Wellington Mara. You can follow any responses to this entry through the RSS 2.0 feed. You can leave a response, or trackback from your own site. have fun up there in new york,we will be watching the ball drop from here in florida.be safe and god bless to all,and happy new year too everyone.new york city has always been electric and the new york giants better be electric tomorrow night at metlife love the prediction rob.lets hope there up by 10 with 2 seconds left on the clock.we all know by now the g-men cannot leave more then a couple of seconds left on the clock when there ahead in the 4th quarter lol.no heart failures tomorrow night,the g-men need to give there fans a nice easy victory.how about a blowout..giants 45-dallas 3,im going to keep good thoughts for the new year. Hey thanks Bobby and the same to you and your family! I am also predicting a Giants win but not by the huge margin you predicted. I think Manning will need to win this game in the 4th quarter and we will win by 6 points. Happy New Year!! !